For upcoming workshops with Mark visit Restoration Agriculture Development website to find out more. To buy woody perennial that can tolerate climate extremes, droughts and floods directly from Mark’s nursery, visit Forest Agriculture Enterprises. To schedule Mark for a design consultation, restoration agriculture installation, workshop, or speaking engagement use this contact form. New Forest Farm doesn’t accept interns or apprentices but the farm operates as a collaborator with independent enterprises. Housing, food, and money are not provided. However, land and equipment are available for rent and use. For more info read Mark’s letter. Mark is the founder and President of the Restoration Agriculture Development, and CEO of Forest Agriculture Enterprises. He teaches Agroforestry and Permaculture worldwide and has also written the book, Restoration Agriculture. He runs New Forest Farm, the 106-acre perennial agricultural savannah, considered by many to be one of the most ambitious sustainable agriculture projects in the United States. Mark and his wife Jen founded New Forest Farm in 1994. It’s now one of the most developed and productive perennial farms in North America – trees, shrubs, vines, canes, perennial plants and fungi are planted in association to produce food (for humans and animals), fuel, medicines, and beauty. The farm is a planned conversion from a typical row-crops grain farm into a commercial-scale, perennial agricultural ecosystem using oak savannah, successional brushland of eastern woodlands as the ecological models. The farm is entirely solar- and wind-powered, and farm equipment is driven by locally produced biofuels. Over the last 15 years, Mark has planted an estimated 250,000 trees on his 106-acre farm. He uses agroforestry systems and alley cropping and silvopasture techniques. The main crops are chestnuts, hazelnuts and apples. He also grows walnuts, hickories, pine nuts and pears, together with cherry trees, asparagus and winter squash. Cattle, pigs, lambs, turkeys and chickens also roam on the restored savannahs at New Forest Farm. Finally, on his farm, he offers tours, practical workshops and permaculture design courses. His other business, Forest AG, offers a wide selection of perennial nursery stock, as well as tree planting and nut processing services. 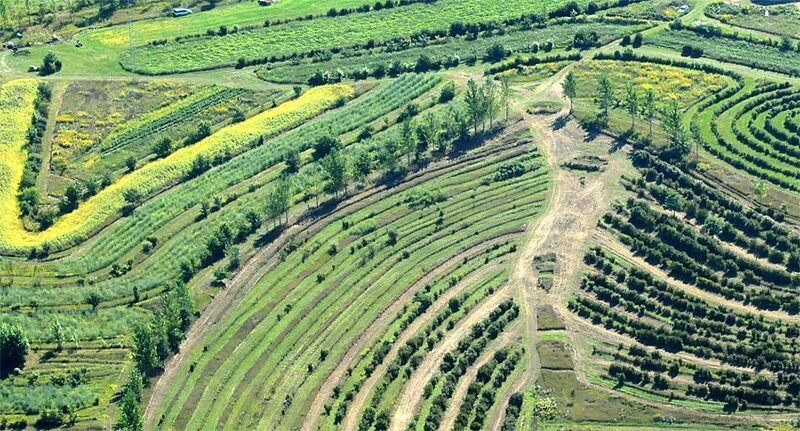 The nursery offers bare-root dormant nursery stock of food producing and woody crop plants, aiming at larger-scale Restoration Agriculture, Silvopasture, Agroforestry, and Permaculture growers. Also, medium scale woody crop growers can use the post-harvest processing equipment at the price too. Consultation and design services are part of Restoration Agriculture Development, a sperate business again where Mark and the other designers specialise in whole-systems, ecological land-use planning with an emphasis on agroforestry practices and permaculture design – based on the New Forest Farm model. As you can read from above Mark’s income is very diverse and most importantly has been changing throughout the years. It’s hard to give exact percentages but I’ll try to give you an idea of how this progression looked like. For all of you reading this, Mark has a message for you and it goes like this: “If you think you can move somewhere, buy land and make your living just from agriculture – you should think again”. Interested in what exactly Mark was talking about? Here is a full post.